Welcome to the third Wellness link up of 2019! You might like to read my January wellness post here, and February wellness post here. 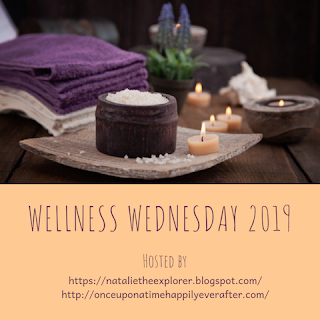 Feel free to join in on the fun with your recent or past wellness-related posts every second Wednesday of the month. I was at home the month of February which made it easier than when I travel to achieve my health goals. I use a simple sheet to keep track of all my goals for 2019, and write a monthly wrap up on my blog. My February wrap-up, including my Health activities, is posted here. For this month's Wellness post, the optional prompt is Indoor or Outdoor Fitness. I live in Ontario, Canada. In the winter months, the weather is unpredictable so it's necessary to do fitness activities both indoor and outdoor to stay healthy throughout the year. Today, I'm sharing my 'fit and fun' outing to the Ice Breakers 2019 event in Toronto's Waterfront area. This is an annual outdoor event that showcases five winners of the Ice Breakers International Design Competition. Let's take a closer look at the five installations. 1. Tweeta-Gate by Eleni Papadimitriou and Stefanos Ziras of Space Oddity Studios SOS (Athens, Greece) - I like the yellow colour, the different shapes of the gates, and the small bells attached to the corners of each gate in this design. When you reach the end of the gate, you can see Lake Ontario. 2. Chroma Key Protest by Andrew Edmundson of Solve Architects Inc. (Toronto, Canada) - I like the green colour and the simplicity of this design. The twenty-five wood buoys are anchored in a basin so I can look at them from the bridge but cannot touch them. 3. Stellar Spectra by Rob Shostak and Dionisios Vriniotis (Toronto, Canada) - I like how this art installation invites interaction. When I look at the two light grey columns from the side walk, they are not that interesting. 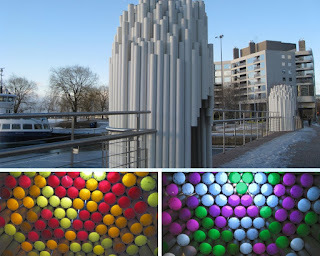 However, when I step inside each column and look up, I see warm colours (red, orange, yellow) in one column, and cool colours (blue, green, purple) in the other. 4. Tripix by Ryerson University (Toronto, Canada) - The modern look of this design is interesting. When I examine it closely, the reflective panels and how light gets through the gaps give a kaleidoscopic effect. 5. Connector by Alexandra Griess and Jorel Heid (Hamburg, Germany) - I like the striking orange colour of this design and how it invites interaction. I've seen children speak into the black mouth pieces at the corners and listen to the sound transmission. An enjoyable walk along the waterfront on a sunny day. Positive sensory experiences from the visual art exhibits, the clear blue skies, the lake view, the sound of the bells, the touch and feel of most exhibits, the sunlight, and the cold air. Elements that support wellness: The art installations are along the Waterfront Trail which is open year round to cyclists, joggers, and pedestrians. Fun: The art exhibits are interesting and interactive. New experience: It was my second visit to the Ice Breakers event so I'm familiar with the event but the exact locations of the art installations changed slightly. I wrote about Ice Breakers 2018 here. Uniqueness: The Ice Breakers event is once a year and each year five new winners are chosen. I was pleased with how well this winter outing turned out. I left the Ice Breakers art installations feeling energized and joyful. Another fun walk, another good day! I look forward to doing more fit and fun walks in the Spring. The next Wellness link up will be on Wednesday, April 10. Optional prompt: Healthy Mind. Which of the above five winners do you like the most? I'd love to hear your comments. I wonder why these sculptures are called "ice breakers" They are all very original. Love the last one, looks like Spaghetti ! Thank you, Gattina, for your visit and comment. I think the term "Ice Breakers" in this case is for marketing purposes and is more along the line of 'breaking the ice', 'getting to know' expression. The theme of the art installations changes annually. This year's theme is "Signal Transmission". What a great installation to promote outdoor fitness over the winter. It's autumn here and the rain is beginning to impact my running... even with the rain it is invigorating doing my cardio out doors. Being outdoors and close to nature really elevates the fitness experience. Safe running to you, SSG. The Wellness prompt is optional, Sue, so no need to feel restricted by it. I like the variety of the posts in the link-up. Plus Listening to your inner voice is a good reminder. Thank you for joining me. I'm grateful to live in a city that supports the arts, Min. Snow flakes are magical and fresh snow is a beautiful gift from Mother Nature. Of course for people who have to shovel the snow, it's work but the snow doesn't last. Hi Min - I found your 2nd comment from my email but couldn't locate it in Blogger so I copied and pasted it here... Thank you for hosting ZTT and sharing Zen tips. Finally remembered to get my rear in gear and get a post written so I can take part in your Wellness Wednesday. I love your post with all the creative and unique public art pieces. Thank you for sharing something I wouldn't have a chance to see otherwise!! Thank you, Trisha, for joining us on this Wellness Wednesday. I greatly appreciate your post. The next Wellness link up is on April 10. Optional prompt Healthy Mind. I love this idea. It must be tough in the winter months in your climate to get outside, but an event like this would be temptation enough. I'm used to the four seasons, Jo, and I love walking outdoors. The art installations are fun to visit. Thank you for stopping by. Hi, Natalie - The Ice Breaker's winning entries look amazing. I love them all -- especially the first one (Tweeta-Gate). I like the yellow colour, the different shapes of the gates, and the small bells attached to the corners of each gate in this design. When you reach the end of the gate, you can see Lake Ontario. Hi Donna - I like the Tweeta-Gate, too. I'm glad that the five winning entries offer different and bright colours. Thank you for stopping by. Yes, Stella Spectra is a nice surprise. Thank you, Lydia. Have a great day! I like the last one, Connector. It certainly stands out against the snow! The bright orange is striking, isn't it? Thank you, Kirsty, for stopping by. Oh cool, I love art installations like this. I like all of them! I like them, too. Thank you, Alicia, for your comment. So challenging to get outdoors in the middle of winter! Thank you, Michele, for you visit and comment. We're heading to spring now with sunny days and sidewalks that are clear of snow and ice. That looks like such a fun excursion. Certainly better than just walking about this one had lots of color and interest to hold you and you might have felt as if you were in an amusement park or a fairy garden. The different art designs and colours certainly make my walk more fun. Thank you, Mary, for your visit and comment. What a fun time!! This makes it fun to get out in the cold weather!! The art works are quite fun to visit. We have spring weather this week so no more ice and snow. Thank you, Jodie, for stopping by. I love being outdoors, Natalie. It's nice when you can combine that with some culture. Have a lovely week! Yes, it's a nice combo. Thank you, Christie, for stopping by. Enjoy Spring! That will be great, KB. Looking forward! The bright orange Connector really stands out. Thank you, Debbie, for stopping by. Thank you, Sue. You have a great week, too. Hi Natalie - it sounds like you had a fabulous time. We have Sculptures by the Sea happening in Western Australia atm and there are so many FB posts from my friends who live in the city (where they're set up) commenting on how much they love them - for all the reasons you give with your outing. Hi Leanne - The Sculptures by the Sea event sounds like a lot of fun. Thank you for hosting MLSTL and sharing on your SM. Hi, Natalie - I've shared this on my Social Media. Thank you, Donna. Happy 1st day of Spring! Thank you, Denyse, for hosting LTW. I look forward to reading your post next week. Breaking the ice... it’s really a good motivation, I believe it sure. Eeek! Look at all that ice. My feet a freezing just thinking about it. Proper Canadian winter boots required :) The ice and snow are all gone by our first day of Spring (today). The art installations have been removed as they're temporary exhibits. And thanks for linking up over at My Corner of the World, too! It’s great that the city promotes getting out of doors in the winter through things like art installations. Yes, I think so, Jude. I look forward to this event in the winter. Thank you for stopping by.